Man and demon wage war with one-on-one fights in the 1-on-1 fighting game Galaxy Fight. Eight of the universe's greatest fighters enter into combat for the fate of the galaxy. Success brings great acclaim to the victor. Failure brings death. Once every 1000 years, a being of divine power takes physical form somewhere in the galaxy. This time, he has taken form on the planet Danius. This being, who refers to itself as "Felden Crayce" is being sought out by fighters across the galaxy to challenge and defeat. Each of these eight warriors have their each with their own reasons for seeking out and fighting this being -- some wish to challenge Felden for pride or fame, some wish to protect their home lands from Felden, and some refuse to explain their reasons until they meet this great force themselves. These eight fighters all have unique abilities and strengths, but only one can be the final victor! 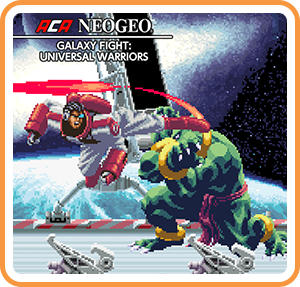 Where can I buy ACA NEOGEO GALAXY FIGHT: UNIVERSAL WARRIORS physical/digital?